Technology constantly builds on other technology. This computer-delivered editorial is the result of advances in electronics that allowed for the creation of computers, which in turn led to breakthroughs in the software running on those machines and to the formats that support display and distribution. Standards build upon each other, too. They create a complex network of interconnected documents, interlinking references, and dependencies; some normative, others not. And despite advances in digital distribution in recent decades, the distribution of standards has been hampered by a lack of consistent structures that allow us to free our documents from the limitations of PDF and move them into robust use. 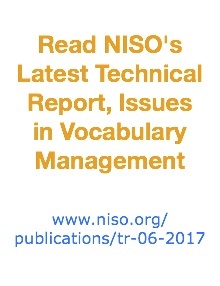 Last month, NISO published the NISO Standards Tag Suite (NISO STS), a derivative of the NISO standard Journal Article Tag Suite (NISO JATS). NISO JATS is a great example of how standards can facilitate interconnected documentation and ideally an example of how standards can be adapted to offer fully robust content. Similarly, the new NISO STS could affect broader interconnectedness in the standards development community and improvements in how people use our outputs. Ideally, if adoption of NISO STS is successful, several things will happen. First, the cost to standards developing organizations to create XML documents will fall as vendors expand their market and reduce the need to customize their tools. This should lead to reduced production costs for standards developers of all sizes. Next, tools for using and distributing standards will show increased functionality and lower costs. This should boost the availability of standards and allow for more functional end-user tools. Finally, a more robust network of interlinked documents will allow for easier navigation and engagement with published standards. Ideally, this will lead to greater conformance with those works. In conjunction with the launch of NISO STS, NISO hosted our first meeting outside of North America, a Geneva, Switzerland forum on XML for Standards Publishers. The meeting was a tremendous success; it attracted more than 70 participants and allowed us to further extend NISO's reach outside the United States. Over the years, we have increasingly focused on the international ecosystem of content distribution, discovery, and interoperability. We hope these efforts mean that NISO is recognized as working both domestically and internationally and not simply as a 'National' organization (despite our full name). We have long operated outside of U.S. borders, and this project helps us to extend that practice. I've strongly encouraged our community to think and operate globally. One of my favorite quotes is from St. Augustine of Hippo, who said, "The world is a book and those who do not travel read only one page." NISO's work--not only that on XML for standards--travels the globe and reaches a worldwide community. Mark your calendars for these webinar dates in November and December! NISO's fee structure allows your organization to gather an unlimited number of staff in a conference or classroom setting to view the event on the day of the broadcast. Access to an archived recording of the event is always included, regardless of membership status. Coming Soon: The announcement of NISO's 2018 calendar of webinars, virtual conferences, and training series! The first half of this two-part webinar program (scheduled for November 1) will provide an overview of the current landscape of options available to academic institutions for ensuring and streamlining access to materials by legitimate users. What's working, which technological approaches may be outdated, and what needs to be done (research, technology upgrades, etc.) to resolve related problems? The second half of the webinar (scheduled for November 15) will provide an overview of the issues associated with delivering quality metadata by and to various stakeholders. Based on comments heard at conferences and in meetings, it's an old issue. But what are the existing barriers to delivering reliable metadata? What improvements might be made in the process? What stands in the way of successful implementation? Confirmed Speakers: Judy Luther, President, Informed Strategies; Phil Leahy, Services Relationship Manager, Eduserv; Ellen Rotenberg, Director, Product Management, Platform Capabilities and Services, Clarivate Analytics, and Rick Stevenson, Manager, Tech Operations, Clarivate Analytics. Speaker titles and abstracts are available on the NISO event page. Confirmed Speakers: Patricia Payton, Senior Manager, Provider Relations, Proquest/Bowker; Scott Anderson, Associate Professor & Information Systems Librarian, Millersville University; Marilyn White, E-Resource Librarian, Briget Wynne, Reference and Interlibrary Loan Librarian, and Katelynd Bucher, Metadata Librarian, Research Library Group, National Institute of Standards & Technology (NIST). Paying by credit card? Save 25% on the November event by registering online for both segments! It's also possible to register online for just Part One or just Part Two. In 2016, NISO announced an initiative aimed at development of best practices for documenting and understanding users' paths between discovery of content and accessing the content. Did users come in from a discovery service, Google Scholar, or some other available channel? What should that signify to service providers? What does that mean for libraries? This session will spotlight the size and scope of the issue as well as the progress that may be made towards its resolution. Confirmed Speakers: Ken Varnum, Senior Program Manager for Discovery, Delivery, and Library Analytics, University of Michigan; Peter Vlahakis, Product Manager, ITHAKA; Dan Paskett, Director, Shared Shelf Outreach Coordinator, ITHAKA; and Allison C. Belan, Associate Director, Digital Strategy & Systems, Duke University Press. Paying by credit card? Register online. Altmetrics is an active area for a variety of reasons. There is an ongoing need to justify the work, space, and resources invested in the library. How best to generate, synthesize, interpret, and deliver the most useful data to demonstrate the return on investment made by the institution is a constant concern. What are best practices for using altmetrics in assessment efforts? How comfortable are faculty with the use of altmetrics in the context of tenure and promotion activities? NISO's working group on altmetrics has built a better understanding of related use cases, but already there are discussions of whether new metrics might be usefully framed for measuring research impact outside of the academic environment or for capturing the value of unconventional research outputs. Will indicators regarding views and downloads be sufficient to evaluate the usefulness of data sets? What example might be provided by studies of COUNTER, SUSHI, and SUSHI Lite? What alternative approaches might be needed or fostered in order to ensure the discoverability, usability, and reproducibility of scientific data sets? Confirmed Speakers: Mike Taylor, Head of Metric Development, Digital Science; Andy Herzog, Faculty Services and Online Engagement, Department Head, University of Texas at Arlington; Patty Smith, Impact and Dissemination Librarian, Galter Health Sciences Library, Northwestern University; Daniella Lowenberg, Research Data Specialist & Product Manager, California Digital Library; Martha Kyrillidou, PhD., Principal, QualityMetrics, LLC; Stacy Konkiel, Director of Research and Education, Altmetric; with other speakers to be announced. NISO's Library Standards Alliance (LSA) members automatically receive access to all of the fourteen 90-minute webinars offered annually by NISO as a member benefit. (Check your institutional membership status here.) NISO Virtual Conferences require a separate registration in order for any member to participate. NISO KBART: The Future is Automation! Wednesday, November 8, 11:35 a.m. - 12:15 p.m. In this session, members of the KBART standing committee--tasked with the maintenance of the KBART format, endorsement, and market education--and of the KBART Automation Group--tasked with creating recommendations for a standardized automated transfer process--will discuss their work. Friday, November 10, 9:45 a.m. - 10:30 a.m.
Building on CNI's Report on the Authentication and Authorization Survey conducted in 2016, the STM Association and NISO have been convening conversations focused on how to improve the user experience and provide a more seamless access experience to users, while also providing greater control and analytics over network activity. This session will feature updates in this important area, and explore the issues of accessibility, privacy, and security being addressed through development of multi-stakeholder pilot projects. Friday, November 10, 10:45 a.m. The e-book publication space is still young, with publishing models and content models evolving day-to-day. One particularly difficult area for many members of the e-book supply chain is receiving and working with quality e-book metadata. The NISO E-book Metadata Working Group is tackling this complex area of work to determine specific uses for various metadata elements in different users' workflows; its work will be the subject of this presentation. Discovery Pathways Make Tracking a Link a Dicey Proposition: NISO Tracking Link Origins Count Correctly! A NISO Recommended Practice, Tracking Link Origins, will soon be available in draft form for public review and comment. This document is the output of a cross-stakeholder working group that investigated options for full reporting of link origin information when users connect to a publisher's content via a discovery service. Ace, a software that is newly in beta release from DAISY, can help answer the question of whether material is truly accessible to disabled users. Among other features, Ace runs accessibility tests on EPUB documents and acessibility related metadata. Figshare has released its annual examination of global attitudes toward open data. This year's report includes such articles as "Outputs Sharing: A Perspective from the Wellcome Trust" and "What Open Data Means for an Institution - The University of Cape Town." A crowdsourced spreadsheet produced by a partnership of UK Higher Education Institutions, Jisc, and publishers helps students to know, ahead of purchase, which ebooks are accessible to those with disabilities. "There is apparently nothing that the shared-database technology known as blockchains can't fix. At least, that's the impression given by the horde of governments, banks, entrepreneurs, and tech companies working on the technology. But what is a blockchain and why the excitement?" In 2011, the Copyright Office began to assess how to support mass digitization projects. One result of that work was the Office's 2015 Orphan Works and Mass Digitization Report, which recommended that a pilot program test "extended collective licensing," or ECL. This new report from the Copyright Office describes the results of the pilot and documents related public comments. The NISO JATS Standing Committee has completed reviewing the requests for changes to ANSI/NISO Z39.96-2015 (V1.1), JATS: Journal Article Tag Suite from the release of that version through April 10, 2017. This document lists the committee recommendations made in response to those change requests. Public comments are invited at http://www.niso.org/apps/group_public/add_comment.php?document_id=15932. NISO Voting Members participate in the development, revision, and evaluation of standards. Voting Members are able to influence the standards process and mold the future of the industry. The following ballots are open and will close before the next issue of Newsline. If you are a NISO Voting Member, log into your NISO page and you'll see the ballots linked there. New versions of EPUB will be developed in W3C, since International Digital Publishing Forum merged to W3C in January 2017. This ballot closes on November 10, 2017. This International Standard sets out rules for the presentation of an abstract sheet in a periodical or other serial publication. This International Standard sets out rules to ensure that translations are presented in a Standard form which will simplify their use by different categories of User. This International Standard provides a code for the presentation of names of scripts. The codes were devised for use in terminology, lexicography, bibliography, and linguistics, but they may be used for any application requiring the expression of scripts in coded form. This International Standard also includes guidance on the use of script codes in some of these applications. This international Standard specifies the information to be printed on title leaves of books and the manner in which this information should be presented and arranged. Its purpose is to help editors and publishers to produce title leaves that facilitate unambiguous citation by users such as booksellers, librarians, documentalists, authors, indexers, cataloguers, database producers, etc. The following are also systematic review ballots; these will close on November 21, 2017. This International Standard lays down rules for the presentation of the information to be provided in the header areas of microfiche produced for distribution by, or to, libraries and information centres. It is applicable to original micropublications as well as to microfiche editions of monographs and serials and their contributions. It is applicable equally to complete works as well as to parts of works and to catalogues whether the microfiche are produced by computer output microfilming KOM) or other methods, for example step-and-repeat camera. This International Standard describes the elements required for the identification of series and Parts thereof and gives rules for the presentation and place of such elements. Its purpose is to enable publishers and editors to identify publications grouped in series, thus facilitating the acquisition and recording of series. This International Standard gives rules for the presentation of theses and similar documents in all disciplines. This International Standard establishes rules for the general layout (Position and orientation) and use of spine titles and corresponding text used on books, serial publications, periodicals, reports and other forms of documentation such as cases, cassettes, and comparable items intended for placing on shelves. lt is applicable only to text with Roman, Greek or Cyrillic characters. lt includes rules for allocating a space on the spine, to be used for library identification purposes, and rules for the use of edge titles.